A DC Metro vintage fanatic's perspective covering all things from vintage fashion and vintage life to surviving the Beltway and the modern world! In preparation of our date, I wanted to do a different look this time. 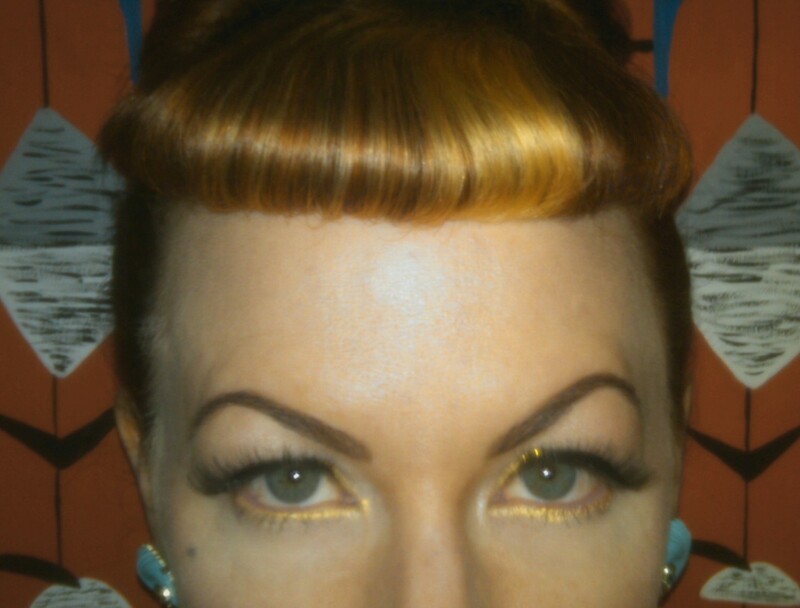 I usually do victory rolls or maybe a "hair down" look (now that it is growing out nicely) but last night I decided to do an updo I saw in a tutorial by BerlinHairBaby on Youtube. I have watched several of her video tutorials and they are awesome! I love her thorough and in-depth instructions and she is a doll!! 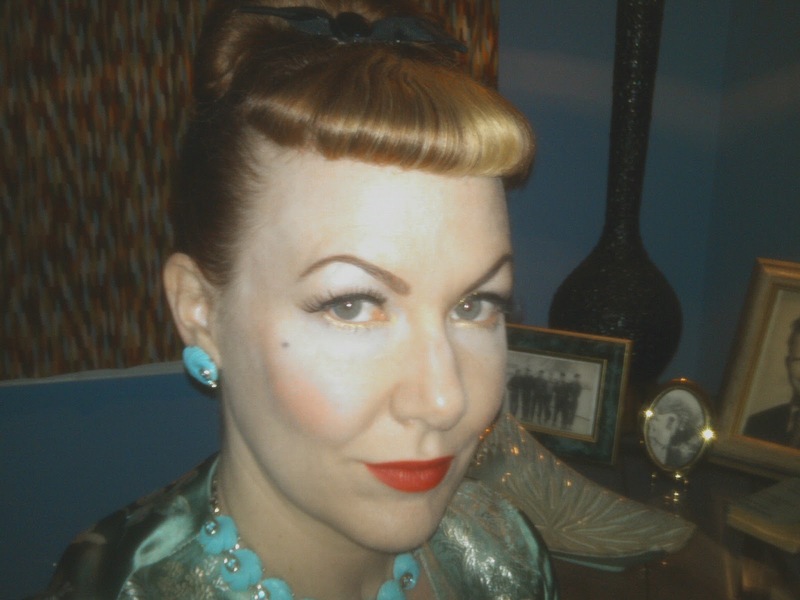 To match my look, I wore a light aqua satin brocade bolero jacket my auntie bought in the UK for me, a black Stop Staring wiggle dress, 50s vintage black velvet stilettos, and a 50s-era Lisner parure set. 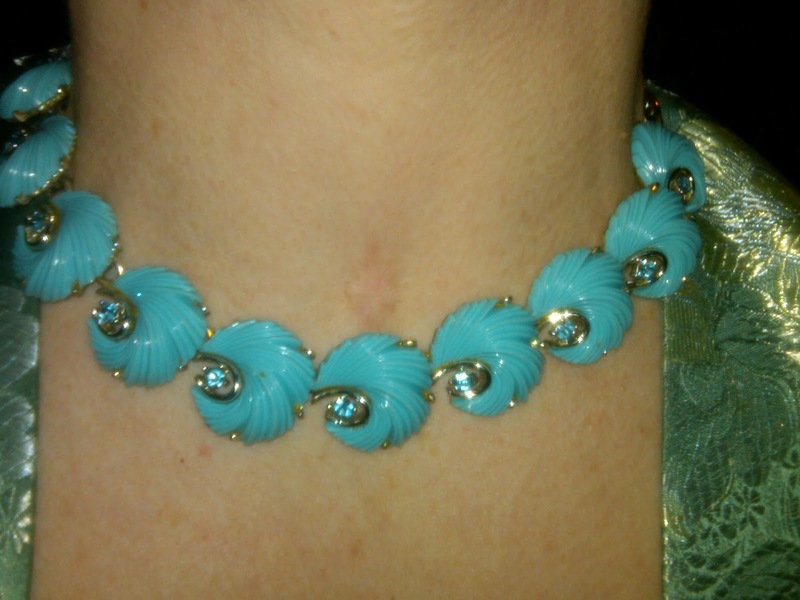 The set is made with silvertone metal, blue rhinestones, and a aqua-colored lucite or plastic. I am wearing Ardell brand lashes in "105." I wish the "head to toe" picture came out but for some reason, my camera phone was making the images too dark! I looked like I was in dimly lit cave instead of my sitting room! This is the third time I have done this Betty Draper-inspired updo and each time, it becomes easier and easier to create! I am looking forward to trying more styles! So, how was your Valentine's? Between the immaculately styled hair and flawless skin, you are a picture of perfection! Love the lashes too! Thank you, Ginger! The skin is all due to a good concealer! Thanks, Andi! BerlinHairBaby has great videos! I love her 60s updos! Her instructions are easy to follow! Cute hair! And I love the necklace! Thank you, Stephanie Lynn! I was so excited to find that Lisner set for a good price and in such immaculate condition! oooh the do is gorgeous! I love your Lisner set though, my favourite type of jewellery! That's a really nice updo - I love her tutorials, and you have a definite talent for creating smooth updos. Lovely. Also your eye make up, I love the dramatic gold and black. 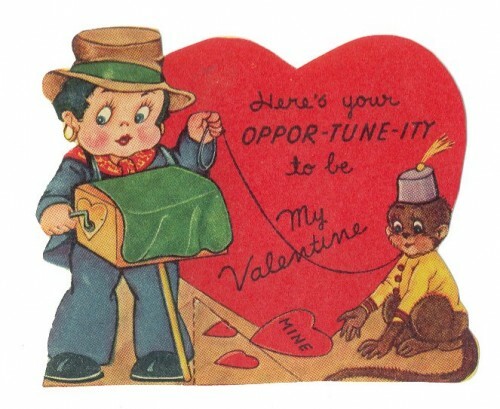 Very romantic and saucy! Thank you, Perdita! 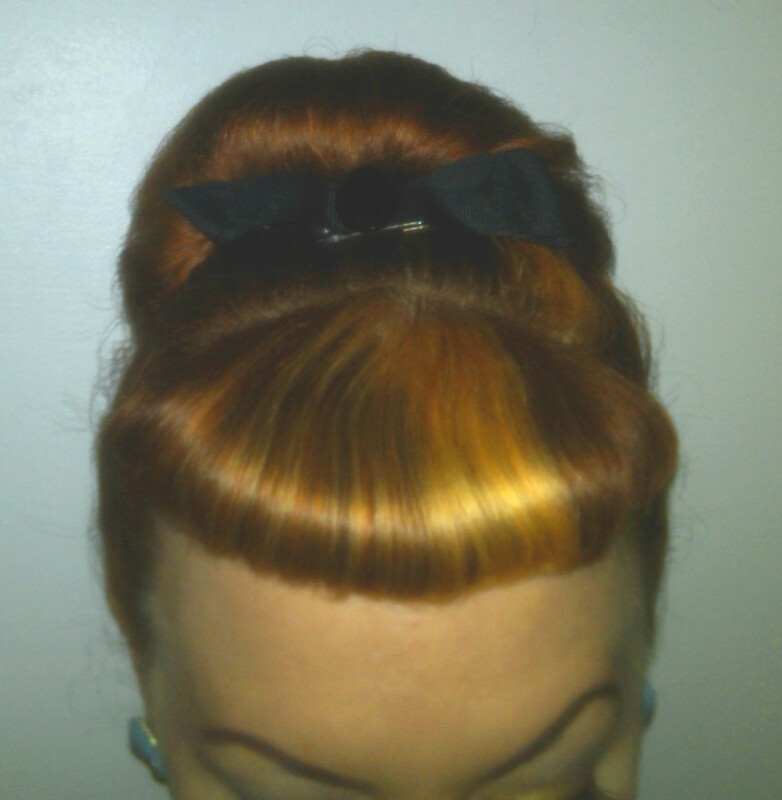 I adore BerlinHairBaby's videos too! 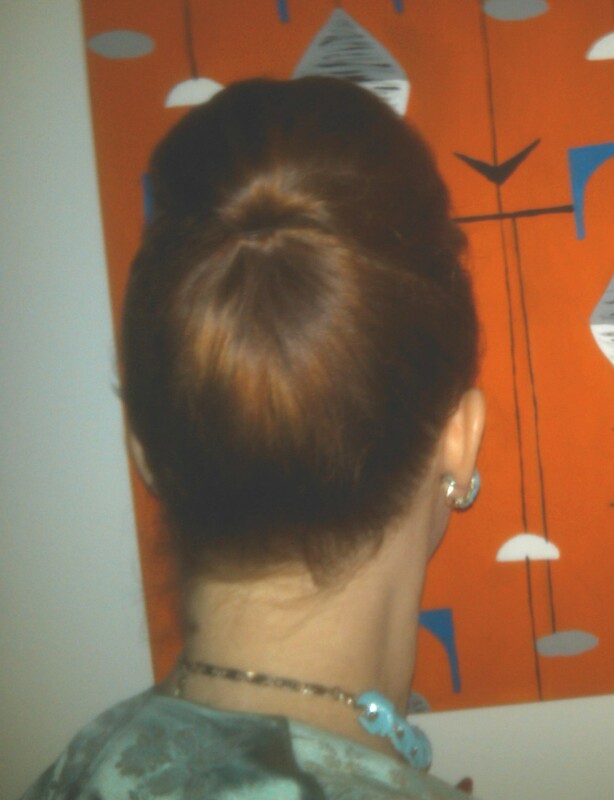 This particular updo came out well but the first couple of times the look was a bit wonky. I am getting better with practice. 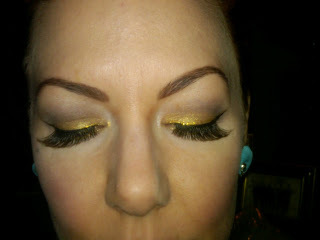 As for the eye look, I used Urban Decay 24/7 Liquid liner in Eldorado and Make Up For Ever liner in 9L. I love both of those makeup lines' eye products! So much sparkle and color! You looked lovely- I really like your hair like that. I must go check out that video. Thanks for sharing it! Thank you, Mrs. MollyDoll! BerlinHairBaby's videos are amazing! I love your hair and the Lisner pieces! I should definitely check out that hair tutorial. Thank you for the compliment and comment! The video link is a definite must look! It is so helpful and I love the little kitty you can hear in the background! As a "crazy cat lady" (I have three), I so wish I could see that little baby! You look absolutely gorgeous Tara!! me gusta mucho su hermoso necklace. An advanced guy shopper, you are able to choose rimless glasses for males. Getting Ready for VLV 15! A Journey of Understanding My Makeup! Note: As of 1-22-11, My blog, "Betty's Vintage Musings," is now "The DC Metro Retro." I was born in the mid-70s in Richmond, Virginia to two fabulous European-born parents. My Norwegian father father taught me to be intelligent and kind, while my Irish mother instilled a sense of fierce strength and independence. Growing up in the 80s, my friends pined for Poison tickets and Guess jeans yet I loved The Cure and wanted vintage wool cardigans and black satin bullet bras. I prided myself on standing apart from the mainstream and having the "audacity" to think for myself. So, here I am, 15-20 years later. I am still in vintage and still questioning everything. I went to college, got married, and earned a Master's Degree. I am a linguist, artist, amateur makeup artist, and business owner. Yet no matter what my job title is or what style I wear, the one thing that matters to me the most is to be kind to everyone. Fight for what you believe in, family and friends come first, and use logic and reason always.